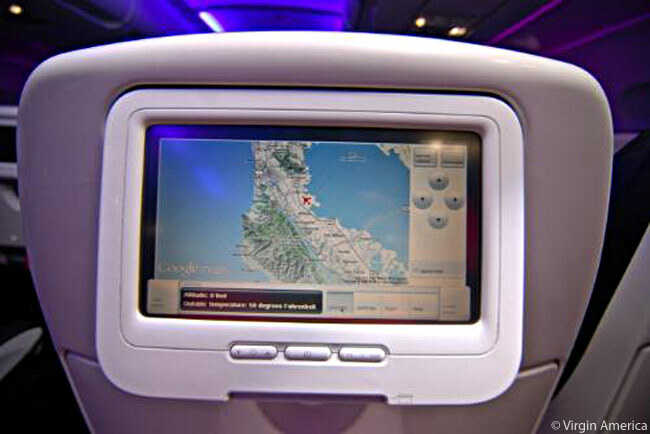 Virgin America has unveiled changes to its Red in-flight entertainment platform which will allow travelers access to new amenities, including enhanced terrain-view Google Maps, an open tab service for the airline’s on-demand menu and what it says is the first-ever seatback digital-shopping platform in-flight. Travelers on Virgin America will now be able to browse hundreds of products and place orders from their seatback touch-screens via the Red store, which Virgin America says is the first seatback digital shopping platform in the North American skies. The Red store shopping platform is powered by SkyMall. With the Red store, Virgin America and SkyMall have teamed up to give flyers the chance to shop from their seatbacks from hundreds of top brands like Sony, Canon, Sharp and Michael Kors. Products range from the Sony PSP with 1 game (which retails for $329.00 and is worth 536 points in Virgin America’s Elevate loyalty program) to the latest Michael Kors tote bag (which retails for $268.00 and is worth 536 Elevate points). The debut of the Red store marks the first time that SkyMall has developed a product line designed specifically for purchase through an airline seat-back entertainment system. In addition to a unique in-flight shopping experience and a range of best-selling products, purchases made in the sky via the Red store will allow guests to earn two points toward the airline’s Elevate frequent flyer program for every dollar spent. ● A custom bar: In July, in addition to its regular selection of cocktails, Virgin America has launched its “Cocktails with Altitude” custom bar, which was developed with the input of frequent flyers, social media fans and in-flight staff. Passengers can select a “Mile High-Tini” from their Red touch-screens, swipe a credit card and the makings for the custom cocktail (which is made with illy issimo Iced Cappuccino and vodka) will be brought to them via tray service. Other cocktails include “Tequila Tea,” top-shelf Tequila and Peach White Honest Tea; and the “Sweet Tree,” eco-friendly VeeV Acai Spirit and cranberry juice. For a video tour of the new upgrades to Red, visit www.youtube.com/watch?v=io39lxCIIBo. I’m glad to see they’ve upgraded this. The last time I flew with them I thought the interactive system was pretty bad in terms of usability. Although I love the concept, and my wife loves the ability to order items through the screen, I found that the interface felt “slow” and half the applications didn’t work (hadn’t been released yet). Am looking forward to my next trip to see how the improvements work.